Stevenson was the only child born into a family of leading lighthouse engineers in Edinburgh. Unfortunately, the "weak chest" he inherited from his mother and grandfather, caused him serious illness many winters and often prevented him from going to his first school, being educated instead by private tutors for long stretches at a time. Although his nurse's strict Calvinism and folk beliefs gave him nightmares as a child, she also cared tenderly for him while he was sick, spending long hours at his bed-side reading John Bunyan and Bible stories to him, and relating tales of the Covenanters. Stevenson was a late reader, only learning the skill at seven or eight years of age; but began dictating his own stories to his mother and nurse to copy for him long before that. He spent most of childhood writing stories, encouraged in this interest by his parents. 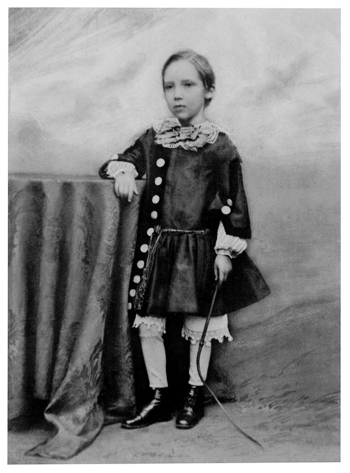 His own father, Thomas Stevenson, had written too as a child, until his father discovered the hobby and ordered him to "give up such nonsense." Thomas even paid for the printing of his son's first publication, an account of the Covenanters' rebellion on its two-hundredth anniversary: The Pentland Rising: A Page History of 1666. Around the fire addressed its evening hours." 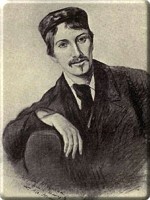 In 1873, Stevenson suffered physical collapse and was sent to the warmer climate of the French Riviera to recuperate. 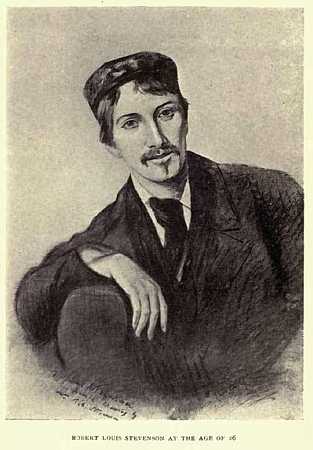 Although he returned to Scotland the following year, he continued to make long and frequent trips to France, where he visited artist colonies and theatres, and became acquainted with other writers and critics. He also met his future wife, Fanny Vandergrift Osbourne, in 1876, an American woman ten years his senior. 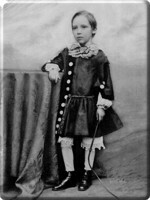 A year after Fanny returned to her home in San Francisco in 1878, Stevenson followed her, against the advice of his friends and without telling his parents. 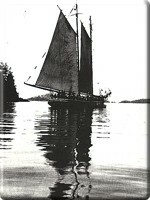 He sailed for the United States on the Devonian, opting for second-class accommodations to add to the adventure of the journey. Stevenson from New York City to San Francisco by train, a trip that was good for writing material but hugely detrimental to his health. He was forced to stop for several weeks at a ranch in Monterey, California, to recuperate before continuing to San Francisco. The two married in March 1880, and they spent the next seven years traveling the United States, England, France and Scotland, in pursuit of a climate suitable for Stevenson's health. When his father died in 1887, Stevenson felt free to take his physician's advice to try a completely different climate. 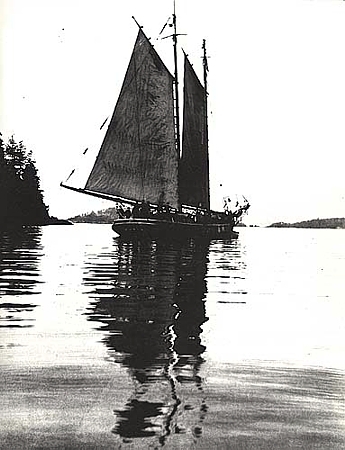 He left Scotland with his wife, stepsons, and mother, and in June 1888 set sail into the Pacific Ocean from San Francisco on the Casco, a schooner with a seven month lease. 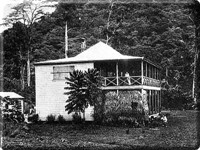 Stevenson found the salty sea air and thrill of adventure on the open sea restorative; over the next three years he sailed to many different islands, including Tahiti, Hawaii, and the Samoans. During an extended stay in Hawaii, he developed a close friendship with King David Kalakaua, and his niece, Princess Victoria Kajulani, who was of Scottish descent. 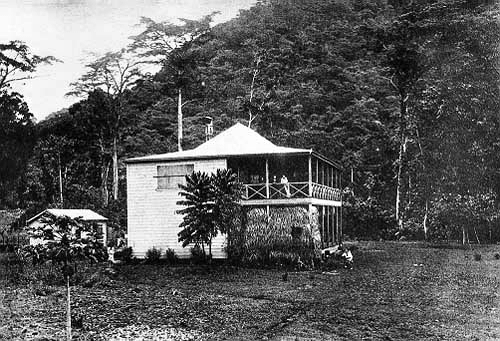 Having failed twice during this time to live comfortably in Scotland, Stevenson made his final home on the Samoan island of Upolu, where he bought four hundred acres and built an estate he named Vailima ("Five Rivers"). He adopted the name Tusitala ("Story Writer" in the native language) and became involved in local native politics. He published such a stinging pamphlet against the existing conditions of European rule over the natives that it resulted in the recall of two appointed officials. By 1894, however, Stevenson felt both his creative and physical life begin to drain away. He died suddenly in December of that year of a cerebral hemorrhage. 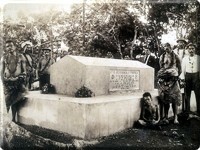 According to local custom, his native friends took up a watch-guard over his body that night, and in the morning they took him in a procession of two hundred to the top of Mount Vaea, where they buried him on a spot overlooking the sea. Stevenson enjoyed his first major success in 1883 with Treasure Island. He was paid thirty-four pounds and seven shillings for its serial publication, and received one hundred pounds when it came out as a book. Since its debut, this tale of piracy and adventure has been made into over fifty film and television adaptations, while Long John Silver has become the archetypical pirate icon. "I don't believe that there was ever such a literary fear before the writing of Dr. Jekyll. I remember the first reading of it as if it were yesterday. Louis came downstairs in a fever; read nearly half the book aloud; and then, while we were still gasping, he was away again, and busy writing. I doubt if the first draft took so long as three days."